The kelvin (K) of a LED lamp meas the colour temperature of the LED light fixture produces. Most of the LED lights are produced between the color temperature of 2800K – 6500K. 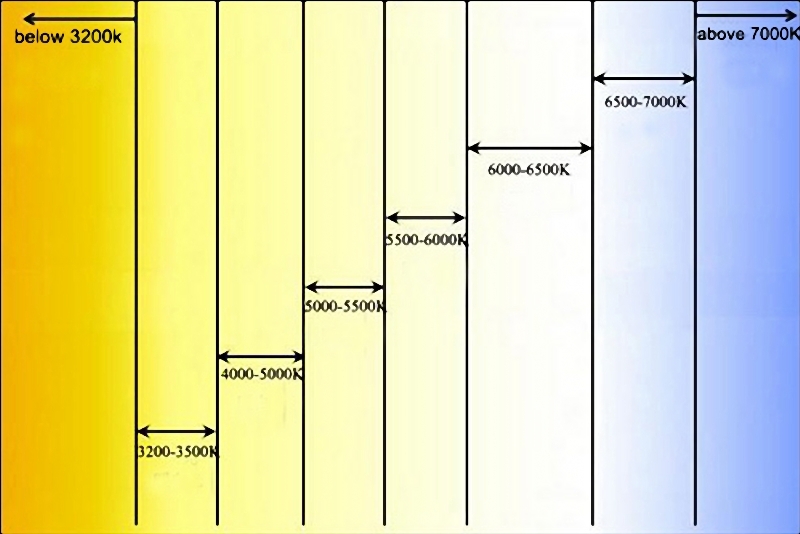 2800K is the yellow side of the colour spectrum whereas the 6500K is a very white light (sometimes we call it daytime light), as you go higher than 6500K, the LED light starts becoming blue and eventually will get to purple. Most normal household halogen or incandescent bulbs are about 2800K where as vehicles halogen head lights are about 3400K. H.I.D (Hight Intensity Discharge) Xenon bulbs are mostly made between 4200K & 8000K but both higher and lower ratings are easily manufactured, but less useful. Basically, HID lamps are standard at 6000K, 4300k is also available as an option. LED lights come in a huge range of colours too, but most of Teehon LED work lights and LED light bars or LED driving lights feature betwen 5500K and 6500K. We chose this colour as is it an excellent balance of both light output and light colour because it is easy on the human eye.